Easy Andes Peppermint Fudge - Chocolate Chocolate and More! Easy Andes Peppermint Fudge – smooth chocolate mint fudge that you can make in 5 minutes with only 3 ingredients! A few weeks ago, there was a post floating around Facebook for a 2 ingredient Rainbow Fudge. I’ve seen the recipe before. One can of frosting and 1 bag of chocolate chips. Results can vary greatly based on flavors. I remember trying this recipe a few years back using semi-sweet chocolate chips and a chocolate frosting. Not the best chocolate fudge I’ve ever had in my lifetime. I’ll stick with my favorite Milk Chocolate Fudge Recipe. But…I always like to try new recipes. And maybe I shouldn’t have tried to improve upon chocolate. White Chocolate chips, however, are the base for many fudge recipes. I also happened to have a can of Wholesome organic vanilla frosting from my Fair Trade USA box so why not try a new type of fudge. I’m a sucker for anything mint and right now Andes mints are on sale. 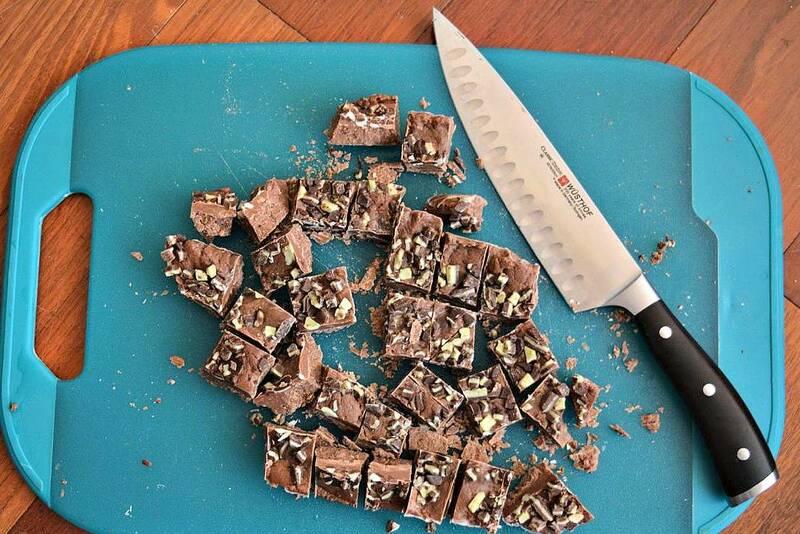 Who can resist fudge made with Andes mints? It takes less than 5 minutes to make Easy Andes Peppermint Fudge but you can claim you slaved over a hot stove for hours. I won’t tell. Since it’s almost Christmas, I’m also going to start suggesting gifts for the cooks on your list (maybe things you should ask for yourself). A few months ago I won an 8-inch Wüstof classic cook’s knife. I’ve already got several cook’s knives but this one is incredibly sharp and well-balanced. The balance makes chopping tasks a lot easier and everyone knows a good cook’s knife is indispensable. I use mine all the time to chop things including the mints in this recipe. When Wüstof asked me to review some other knives I jumped at the chance. They sent me three new knives to try. My new number one favorite kitchen gadget is my Wüstof classic Ikon paring knife. It fits perfectly in my hand so I can pare loads of apples without my hand cramping up and the styling is lovely. They also sent me a classic Ikon hollow edge cook’s knife. I’ve never had a hollow edge knife so I was eager to see if they really work on starchy things like boiled potatoes. I used mine to slice up the potatoes for my white chocolate chai spice bundt cake and potatoes for our Thanksgiving feast. It worked great. I used this knife to slice this Easy Andes Peppermint Fudge. Something about the hollow edge makes sticky things slide right off the blade. The last knife they sent me is their classic Ikon 10 inch super slicer. As the name implies, this knife is incredibly versatile. We used it to slice our Thanksgiving turkey and it cut cleanly through the meat. I’ve also used it on fresh bread. It easily cuts through the crust without crushing the soft insides and it works well on tomatoes too. 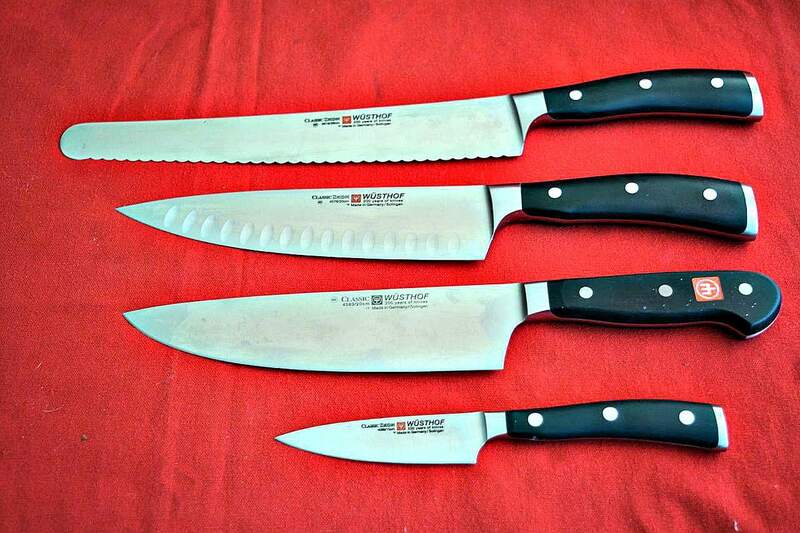 With these four knives, you are pretty set for most kitchen tasks (the only other knife I’d add is a filet knife). So if you know someone who is setting up house or you’re looking for new knives, these are well worth the investment. Line an 8x8" square pan with parchment paper or foil. Lightly spray with cooking spray and set aside. Chop 50 Andes mints and place in a large microwave safe bowl with white chocolate chips. Heat in microwave on high for 1 minute. Stir with a spatula until melted and smooth, heating for an additional 30 seconds, if needed. In a separate microwave safe bowl (I use my 2 cup measuring cup) place frosting. Mircowave on high for 30-40 seconds, until melted and runny. Stir melted frosting into melted chocolate, until combined. Pour into prepared pan and sprinkle reserved chopped Andes candy on top. Place in refrigerator to set, about 1 hour. Remove fudge from pan, using parchment paper to lift out. Cut into 1 inch squares. Store in airtight container in the refrigerator. I am a dark Choc fan. Could I use dark choc frosting instead of vanilla. I really do not like anything milk choc flavor, and i think this might be.. I love a good simple recipe. It really helps at this time of the year. And the minimal ingredients make things so much easier. Just what I need. Perfect! What is the difference between Andes Peppermint Candies Fudge and Andes Mints? Andes Mints are the mints you buy at the store. They are combined with frosting and white chocolate to make Andes Peppermint Candies fudge.